Germany allegedly sent arms to Saudi Arabia in return for the Arab nation giving its support to Germany’s successful bid to host the 2006 World Cup. The claims made by the Die Zeit newspaper are the latest revelations to rock scandal-ridden FIFA. 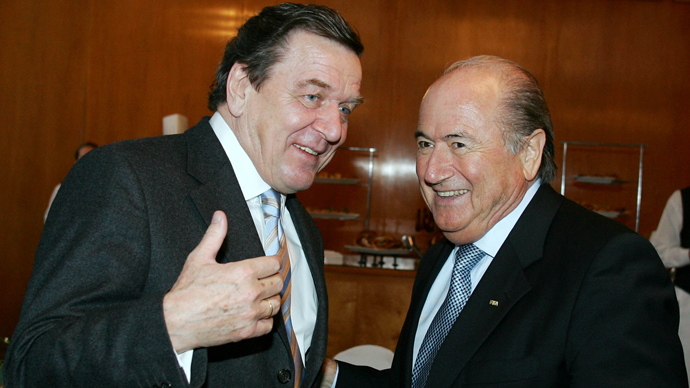 The newspaper claims that the German government under then-Chancellor Gerhard Schroder arranged for the lifting of an embargo of arms sales to Saudi Arabia a week before vote took place in Zurich in July 2000 to choose the 2006 World Cup host. Once the restrictions had been lifted, Schroder’s administration is alleged to have made arms shipments to the Saudi kingdom, which included rocket-propelled grenades. This was done to try and secure the support of Saudi Arabia to vote for Germany as the oil-rich nation had been planning to vote for Morocco, while South Africa were the hot favorites to win the overall vote, to bring the World Cup to Africa for the first time. Germany also went to great lengths to woo other federations. Multinational firms Volkswagen and Bayer promised to increase investment in Thailand and South Korea. This ultimately led to Thailand’s FIFA executive committee member, Worawi Makudi, voting for Germany. This intervention proved to be crucial for the German bid team, which eventually won the vote 12-11 in Zurich, with one abstention, which gave them the right to host the 2006 World Cup. These latest allegations come on the back of a number of scandals that have rocked FIFA and led to President Sepp Blatter saying he will resign, just days after he was elected to serve a fifth term as the head of world football’s governing body. On Wednesday, it emerged that American soccer official Chuck Blazer, who was a FIFA executive committee member until 2013, said he had accepted bribes in exchange for supporting France’s successful bid to host the 1998 World Cup and for backing South Africa in 2010. A 40-page transcript of a secret court session was published about Blazer’s activities. The former General Secretary of CONCACAF pleaded guilty in secret in 2013 to charges of corruption, racketeering and money laundering. “Among other things, I agreed with other persons in or around 1992 to facilitate the acceptance of a bribe in conjunction with the selection of the host nation for the 1998 World Cup,” Blazer told US District Judge Raymond Dearie during a closed-door hearing in New York in November 2013. The scandal broke on May 27, following an investigation by the New York Times on the eve of the vote to elect the new FIFA chief. A total of 14 people were indicted and later arrested by the FBI at a hotel in Zurich for allegedly carrying out wire fraud, racketeering and money laundering.